Enough Said, starring James Gandolfini, reviewed. James Gandolfini as Albert and Julia Louis-Dreyfus as Eva in Enough Said. You’ll need to set aside the whole credit sequence to cry after watching Enough Said, Nicole Holofcener’s new romantic comedy starring Julia Louis-Dreyfus and James Gandolfini. And not just because the closing dedication, “For Jim,” reminds us (as if every frame of the film hadn’t already) that this magnificent actor died too recently, and way too young, for us to have fully realized yet how much we’ll miss him. There’s also the stinging irony that Gandolfini’s second-to-last movie role (the last will be in the upcoming Animal Rescue) is one of the finest performances of his career, and one that suggests a new direction that career might have gone in had he lived. Wrap around all those reasons to weep the fact that Enough Said is a wonderful movie, observant and hilarious and full of sad and beautiful truths, and I think you’ll see the wisdom of bringing sunglasses to the theater. I’ve long thought Nicole Holofcener pretty much walks on water. Her first film, Walking and Talking (1996), is an old favorite, a movie I know almost by heart. I can’t exactly make an objective argument for its place in the cinematic canon, but it made me laugh and meant something to me when I was an aimless, anxious, self-sabotaging twentysomething like the character at its center, played by Holofcener’s frequent alter ego and muse, Catherine Keener. Though I like them all to differing degrees, Holofcener’s subsequent films, Lovely and Amazing (2001), Friends With Money (2006), and Please Give (2010), never burrowed quite as deep into my heart as her first. But it was always a joy to revisit Holofcener’s world, which isn’t like that of any other director now working—if there’s any comparison that comes to mind, it’s with the late French comedy-of-morals master Eric Rohmer. Her films proceed with a natural, discursive rhythm that seems spontaneous, but they’re also fully and carefully scripted. The structure is hidden, but it’s tight. As parallel subplots unfold side by side, you start to see how they inform each other, and by the end it’s clear that the film was about much more than it appeared to be. Also—and this is no small gift—Holofcener at her best can write sensational setup-punchline dialogue in the grand screwball tradition. This makes her a good match for Julia Louis-Dreyfus, whose comic timing we already knew to be as finely tuned as a dolphin’s sonar. But Louis-Dreyfus also gets a chance to deploy her dramatic skills as Eva, a long-divorced single mother who works as a masseuse in Los Angeles. At a party with her best friend (Toni Collette), Eva meets a new massage client, an intimidatingly glamorous poet named Marianne (Catherine Keener). Later at the same party, Eva’s introduced to Albert (Gandolfini), a television archivist who, like her, is divorced with an about-to-be-college-age daughter. They begin, very warily, to date—and then find themselves, against all odds, falling suddenly and seriously in love. That the ethereal (but snobbish) Marianne turns out to be the ex-wife of the schlubby (but warmhearted) Albert doesn’t constitute a spoiler, since that twist not only appears in the trailer but is predetermined by romantic-comedy laws dating back to the invention of the triangle. The story of Enough Said pivots not on how and when Eva finds out the truth, but what she does after she knows it. Unwilling to terminate her relationship with either her new friend or her new boyfriend, she simply decides not to tell either one about her discovery and finds herself in the miserable position of guiltily lying to both. As Marianne (who, like Albert, has no clue as to Eva’s double-agent status) becomes less a client and more a confidante, Eva is torn between loyalty to her budding relationship with Albert and morbid curiosity about how his last one ended. On the home front, Eva’s anxiety about her daughter’s impending departure for college leads her to bond a little too closely with a needy teenage neighbor (the 17-year-old style blogger Tavi Gevinson, touching in her first film role) who’s having a hard time at home. As a result, Eva’s own daughter (Tracey Fairaway) begins to pull even further away. That wisecrack works only because the two lovers in Enough Said so clearly value their ability to make each other laugh. The quest to crack up one’s beloved is a crucial aspect of romantic relationships that most movies barely pay lip service to. 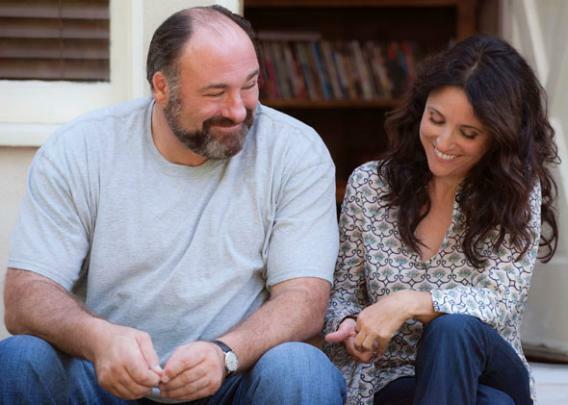 But Holofcener’s razor-sharp dialogue-–and Gandolfini and Louis-Dreyfus’ loose but perfectly judged delivery—capture the way that banter and teasing can both build trust between lovers and tear it down. Later, after they’ve become a couple, there’s a painful scene in which a tipsy Eva embarrasses Albert by regaling her friends with a passive-aggressive comedy riff on his “flaws”: His inability to whisper in movie theaters, his refusal to watch his weight. As they hash it out on the drive home, you’re sympathetic both to his hurt feelings and her defensive confusion. Who among us hasn’t at some point hurt a loved one with a joke that somehow came out meaner than we ever intended it to? It’s at this fine-grained observation of human folly that Holofcener excels, without ever abandoning her compassion for her wayward, fumbling characters. A subplot about Eva’s best friend’s inability to fire her housekeeper gestures, a bit too obliquely, at social satire (Holofcener’s last two films, Friends With Money and Please Give, dealt more explicitly with matters of class and social mobility). But I appreciate that this movie doesn’t make us choose between context-based character humor and snappy romantic banter—instead, it provides both in great bounty. Elaine Benes and Tony Soprano may seem an unlikely pairing, but Louis-Dreyfus and Gandolfini make strangely persuasive bedfellows—in fact, they’re one of the most impossible-not-to-root-for on-screen couples in recent memory. Gandolfini, by all accounts, was a gentle, modest, and sensitive man who felt emotionally depleted by the violent, dark roles he was generally called on to play in the wake of The Sopranos. Here, we get a glimpse of the second career he could have had as a light comedic heartthrob. That it won’t ever come to be is only one of countless reasons to wish Gandolfini were still around.